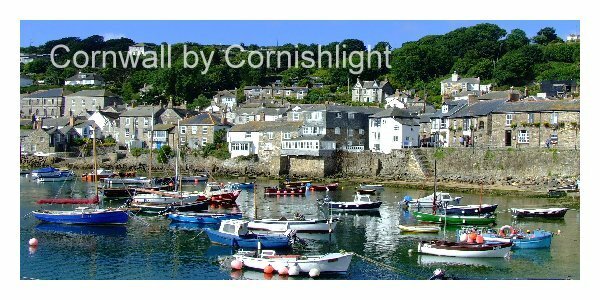 Mousehole- a picturesque fishing village in a beautiful setting. Like Newlyn and Penzance sacked by a Spanish raiding party in July 1595 when the whole village except one house was burnt to the ground. That house, Squire Keigwins, whose owner lost his life defending it, is now the oldest remaining. A hundred years ago it was a bustling place, with the harbour crowded with fishing boats, landing locally caught pilchards, destined to be packed into barrels. Winter in early November timber baulks are laid across the narrow Mousehole Harbour entrance, to keep out the worst of the Winter gales. Even so waves still break over the harbour wall at High Tide. Also in November many of the small boats and yachts, making the Harbour so picturesque in Summer are dragged out of the water using a farm tractor and put into Winter Storage. Please spare a few minutes to remember the loss of the crew of the Penlee lifeboat Solomon Brown in 1981. Christmas Lights On a happier note, November is when the whole village begins preparation for their famous Xmas Illuminations . Switching them on from the Saturday in the Middle of December until the Friday at the end of the first week of the New Year from 5pm until Midnight each day. The Cornish Coast Walk west around the headland and along the Coast Path, looking down on Tater Du Light, and on to Lamorna Cove. Walk east to bustling Newlyn, the largest fishing port in the South West, hence to Penzance with fine views across the Bay to St Michaels Mount . Keen cyclists exploring the Cornish Way may wish to stop off in the village for bite to eat. From Mousehole to Newlyn some parts of this cycle route are off road. There are lots of places to stay in West Cornwall Bed and Breakfast. Don't trip on the gear and nets piled high. Keep away from unfenced drops.